Earlier it was reported that eyewitnesses saw turbines, matching in shape and size with the turbines produced by Siemens, in the port of Feodosia. This morning, Reuters, referring to the testimony of two of its journalists, reported the delivery of two turbines similar to those produced by the German concern Siemens, to Feodosia on July 11. The agency noted that it does not have reliable confirmation that these were exactly Siemens turbines, but their shape and size correspond to the photographs of this company's gas turbine systems, each of which consists of two main components: the turbine itself and the generator. “Reuters has no independent confirmation the equipment on the dock was Siemens-made turbines. It comprised four cylindrical objects, several meters long, and covered with blue and gray tarpaulins,” reads the news of the publication. The photo was taken by Reuters journalists on July 11. 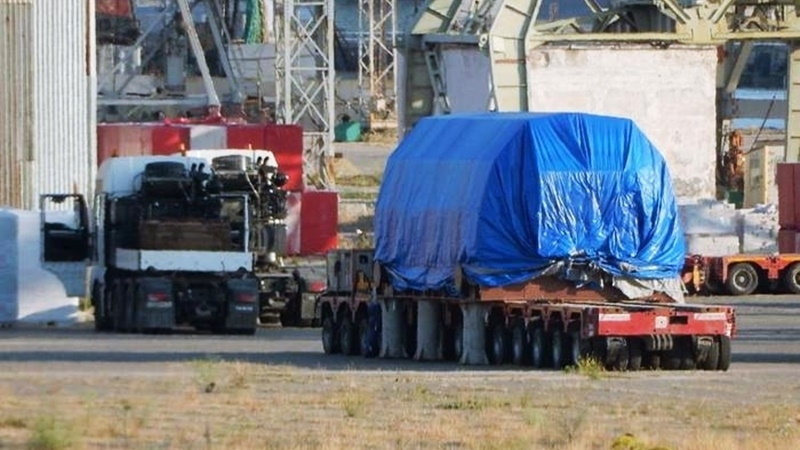 It was further reported that at night on July 13, one turbine was taken by special transport from Feodosia to the suburbs of Simferopol to the construction site of a thermal power plant, according to the reports of social networks users who observed transportation of bulky cargo. It is noted that the armed special forces were deployed along the entire route Simferopol - Feodosia. Police and state security agents prevented a Reuters journalist from following the convoy. “Armed security agents are on the roadside along the highway from Simferopol,” one of the users wrote at about three o'clock in the morning on the page of Autopartner Crimea | Road Accident. In March, the German concern Siemens stated to have delivered four gas turbines to the Russian Technopromexport. According to the contract, the supplied turbines were intended for the construction of a power plant on the Taman Peninsula of Russia. Earlier, Reuters reported, referring to sources, that turbines produced by the German concern Siemens, which Russia plans to use for new Crimean thermal power plants, were supplied in the Crimea, breaching the EU sanctions. At the same time, the Kremlin claims that the turbines installed in the Crimea are produced in Russia from domestic components. Now Siemens declares its intention to apply to court, demanding Russians to take turbines out from the Crimea.